Orginally this post was going to be titled Enterprise: Not trying harder, and taking you for a ride, not picking you up..., but today I had a phone conversation that prompts me to post about good customer service... well, good customer service following some not-so-good customer service. Last week, using the Enterprise website (which is sometimes less than intuitive or easy to use... such as the ability to provide feedback, but that is another issue than what prompts me to write today) I rented a car for pickup this past Friday. I arrived at the location, downtown Portsmouth VA on High Street, around 0800, just as an employee was opening the door. What happened next is clear indication that Enterprise has substantial systems and process issues which must be addressed. The car I'd requested was not available, and in order to get me a car, the employee had to drive me 9 miles to another location to get the car, a car which had 1/2 a tank of gas and hadn't been cleaned. It was nearly 40 minutes and 9 miles from the original location when I finally turned the key for a car with only 1/2 a tank of gas. On the way back downtown I was pulled over and given a ticket for speeding, an offense that wouldn't have occured if Enterprise had fulfilled their end of the bargain by providing a car when and where the computer system allowed me to rent it. I was behind the eight-ball for the rest of the day, walking in late to an important meeting, walking in late not because of my ten minute delay with the Portsmouth deputy, but because of the 30-plus minute delay caused by Enterprise. To boot, while waiting in the office, several phone calls went unanswered, and Ms. Johnson, who called to arrange for a rental was certainly never called back when the employee told her she would be... I know this because the employee was shuttling me 9 miles to Chesapeake to get the car. As a customer, I don't care that the branch assistant manager was recently fired or that the branch is understaffed or that a car needed an oil change and wasn't ready. If you had systems in place, these wouldn't be the norm. And, that the branch had cars on the lot, be it they were "three levels" higher than what I'd booked, I, as the customer, don't care. You allowed me to book a car, now pony up. If I wanted to drive 9 miles to another location, I would have rented from that location. Returning the car today wasn't much of a better situation. While the employees were apologetic, not one of the two employees I interacted with, Thomas and Starla, went out of their way to make things right. I should have been rented a car when and where I showed up; the car should have been fully fueled up (so I didn't have to stop and get fuel on my trip) and cleaned. In short, this experience with Enterprise has been UNSATISFACTORY. There's a part of me that expected nothing to come of my feedback. A day after providing the feedback, I received a phone call from the local regional manager, Jennifer, who, it turns out, oversees 9 offices. We played phone tag until today (between my out-of-office and her out-of-office the game of tag was inevitable). Today we spoke. She was more than apologetic, and, she made zero excuses. Her take, they messed up; it's there job as a company to get it right, and they hadn't. 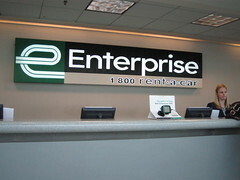 She told me she'd already refunded the money for the car rental and she wanted to ensure me that the next time I rented with Enterprise, they'd show me excellent customer service. I'm due to head to DC again next week, so I'll be taking her up on the offer. I'll tell you what was nice to hear: (a) she'd already done what she could in terms of refunding the charge for the car; (b) she offered no excuses, knowing that I didn't need to hear or want to hear them. I think this is a lesson for all us. Our customers don't care about our problems, they just want things to work they way they're supposed to. Don't saddle the customer with excuses; just work to get it right. While I've even mentioned it in my feedback -- "I don't care that..." -- it's a good reminder for all of us who deal with customers in our jobs. Our customers don't care. They don't care we can't get and keep good employees; they don't care if our suppliers screw up; they don't care if our IT systems can't get things right; they don't care if we've had a bad day or a rough night. What our customers care about is getting our products and services in the agreed-upon manner. We're all human; we all make mistakes, but let's not make rationales or excuses, but rather let's work to get the systems and processes in place to do excellence and deliver a satisfactory customer experience. And, I could take the lesson, too, I know. And, as such, I'm going to make doing customer focus, rather than just teaching customer focus, more to the forefront of my daily work. And, next Friday, let's see if Jennifer has been able to make some systems changes at the downtown Portsmouth Enterprise office.